Each week, Bob Gaughan recaps the events of the college football weekend. JT Barrett led Ohio State to a thrilling 39-38 victory over Penn State in the Horseshoe. Urban Meyer called his performance: ”as close to a perfect performance he’s ever seen by a QB.” Barrett was 33 of 39 for 328 yards and four TD passes. In the fourth quarter he was 13 of 13 for 170 yards and 3 TD passes. The Buckeyes were down 35-20 heading into the fourth. Saquon Barkley had a great first half. He took the opening kick-off back for a TD and ran in from 36 yards out for another. After that the good defensive line for the Buckeyes shut him down. Barkely finished with only 44 yards rushing. This was the type of game that both teams are still in the mix to be placed in the final four at the end of the year. Just like we all predicted Iowa State is currently in the lead in the Big 12. The resurgence of the program has been led by Head Coach Matt Campbell. After shocking Oklahoma earlier in the year the Cyclones defeated 4th ranked TCU 14-7 yesterday. The key to victory was the Cyclones defense forcing two turnovers in the redzone. TCU QB Kenny Hill was awful. He threw for 135 yards and 2 picks. This loss might keep the Big 12 yet again from having a team in the playoff. Coming off last week’s blowout of USC, Notre Dame didn’t lose a beat and defeated 14th ranked NC State 35-14. If Notre Dame wins out they are clearly in the hunt to be put in the playoff. This win was more impressive than the USC victory. NC State has a good defensive line that was averaging giving up 91 yards a game on the ground. Notre Dame had 318. Josh Adams had 202 of those yards. The big turnaround happened early in the third quarter when NC State down 21-14 was driving for the tie. Julian Love picked off Ryan Finley and returned it 69 yards for the score. It was Finley’s first pick in 339 passes. Josh Rosen left UCLA’s 44-23 loss to Washington early with “multiple injuries.” Rosen was sacked four times when he was in the game and had thrown for only 93 yards midway through the third quarter. UCLA has a horrible line and defense. Rosen is the only thing that makes them decent. The same can be said for Lamar Jackson of Louisville. In the month of October, Lamar Jackson has accounted for 1,764 yards. That’s an average of 441 yards per game. He has accounted for 14 TD’s. Oh and Louisville is 1-3 this month. The Cardinals lost 42-32 to Wake Forest. Mason Rudolph passed Brandon Weeden as the all-time TD passer in Oklahoma State history in OSU’s 50-39 win over West Virginia. Will Grier was horrible for West Virgina. He threw four interceptions in the game. Sam Darnold and USC finally broke out with a big win. Darnold threw for 266 yards and three touchdowns as the Trojans cruised to a 48-17 win over Arizona State. Luke Falk was benched in Washington State’s 58-37 loss to Arizona. His replacement threw for over 500 yards. 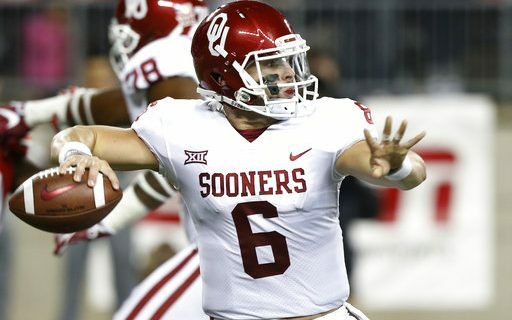 Baker Mayfield had five touchdowns and over 300 yards in Oklahoma’s win over Texas Tech. Josh Allen finally looked good. He threw for four touchdowns in Wyoming’s 42-3 win over New Mexico. Reports out of Florida are that the Gators are looking to part ways with Jim McElwain. The Gators got smoked 42-7 to Georgia. The fan base was wearing t-shirts that had the opening line spread on the game. Florida was 14-point underdogs to their rival. If McEwain is fired the amazing thing will be that Butch Jones wasn’t the first SEC fired. Jones’s Tennessee Vols are now 0-5 in the SEC after dropping another close game to Kentucky. The UB Bulls lost another game they dominated statistically. Akron edged the Bulls 21-20. UB rode the return of Tyree Jackson at QB to put up 459 yards of offense. Jackson threw for 313 yards and Emmanuel Reed rushed for 116 yards and two scores. Adam Mitcheson missed a 46-yard field goal with 1:51 left that would have given the Bulls the lead. The Bulls left points on the board in the redzone. Tyree Jackson threw an interception in the endzone and a holding call took another TD off the board. The Bulls settled for a field goal but in a close game those points were the difference. UB (3-6) returns home on Election Day to face Bowling Green.